Lasagna seems daunting because there are so many layers to it (literally). 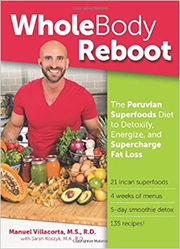 However, it is pretty straight forward and if you give yourself some time on a weekend, you can pre-prep it. Then, during the week, when we get busy, you just pop it in the oven to heat and it’s ready to go. 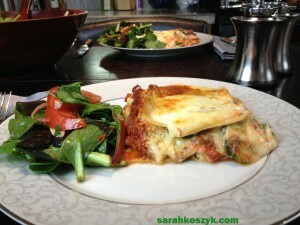 Lasagna is a great dish for Mother’s Day due to the pre-prep aspect. This way you don’t have to cook on your day, but you still have wonderful food to feed your family. We don’t like going out to eat on Mother’s Day because the restaurants are insanely packed. Make this dish this week and you’ll have a relaxing Sunday. Boil lasagna noodles in water for about 8 minutes, or until limp. Remove from water and set aside on a plate, making sure they don’t stick to one another. 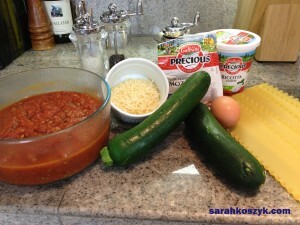 *** While noodles are boiling make sauce & zucchini. See below for directions. Directions for sauce: Spray a large saucepan with cooking spray. Add onion and garlic over medium-high heat. Cook until onions are translucent and the garlic is slightly browned (5 minutes). Next, add the rest of the ingredients to the pan. 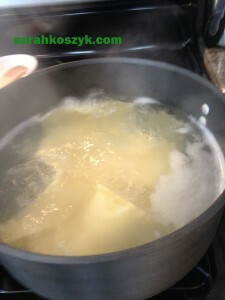 Cover and bring to a slow simmer (when the mixture is slightly boiling). 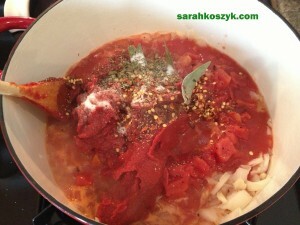 Allow mixture to simmer for a half an hour to build flavor. Remove bay leaves before serving. (Save some sauce for lunch the next day to make pasta and turkey meatballs with). 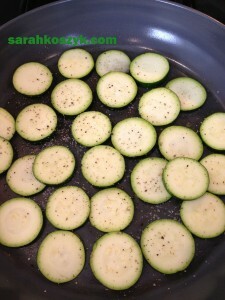 Directions for zucchini: Thinly slice zucchini and cook over medium heat in a pan on the stove sprayed with cooking spray for about 2-3 minutes on each side or until tender. Directions for filling: While everything else is cooking, in a medium size bowl, mix egg and cheeses together until it’s a smooth mixture. 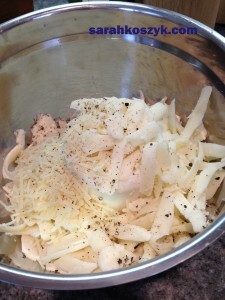 Save 1 cup of the mozzarella to sprinkle on top. 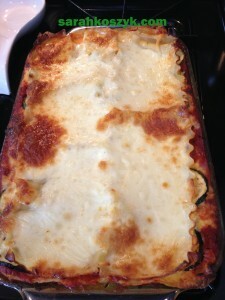 Make lasagna: In a 9x13 glass pyrex, put one layer of lasagna noodles on the bottom, then layering one cup of sauce, one cup of filling after that and then a layer of zucchini. 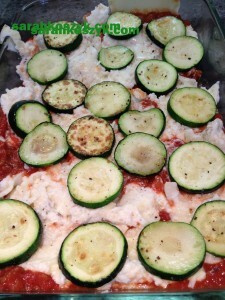 Repeat these layers until pan is filled to the top and you have used all of the noodles, zucchini, and filling. Top with the sprinkled mozzarella. 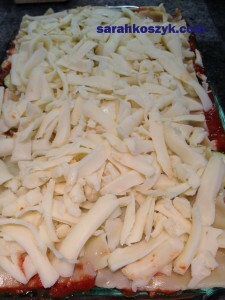 ***At this time, you can cover the lasagna to cook later OR cook in the oven for 45 minutes now. Remove from oven and let sit for 10 minutes before slicing.